Shennel is a girl leader from Monrovia, Liberia, who works to ensure that girls have access to sexual reproductive health services and advocates to end harmful traditional practices. Shennel Henries is a girl leader from Monrovia, Liberia who is 14 years old. Shennel is leading a campaign for girls’ rights in Liberia, where she is developing the Manifesto for the Development and Empowerment of the Liberian Girl Child. As Shennel outlines in this video, the Manifesto promotes girls’ access to education and seeks to reduce teen pregnancy and youth HIV/AIDS infection. Shennel works to ensure that girls have access to sexual and reproductive health services and is advocating to end harmful traditional practices like child marriage. To get her message out, Shennel meets with traditional leaders advocating for girls’ rights and also participates in activities such as World Population Day. 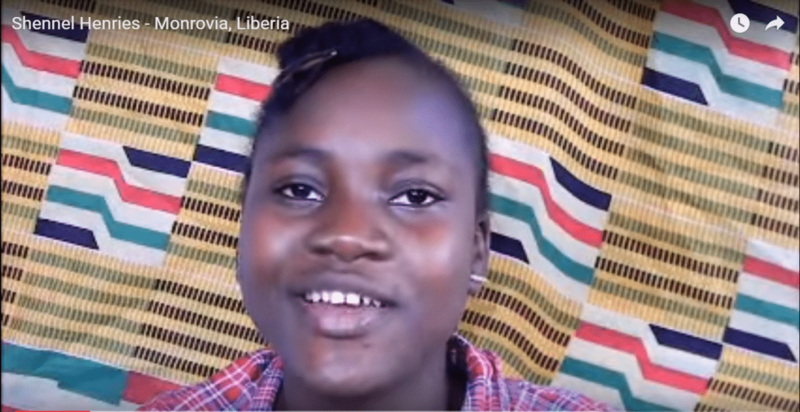 Transcript: Hello, my name is Shennel Henries, I am 14 years of age and in the 10th grade from Monrovia, Liberia. The many problems girls face around the country are teenage pregnancy, early marriage, and gender based violence. Under child marriage, girls are forced into child marriage because of their traditional and cultural practices. Because of these (problems), I’ve gotten involved in many things, like putting together the Manifesto for the Development and Empowerment of the Liberian Girl Child. The Manifesto outlines key areas: sexual reproductive health, education and cultural and traditional practices. Regarding that, on the World Population Day, we met with the traditional leaders in order to stop some harmful traditional practices, and we worked it out. All these have impacted my life greatly. Now I am attending the Alliance Francaise because I want to learn many languages, and my goal is to become an ambassador. Let Girls Lead is a global movement that empowers girls and their allies to lead social change through advocacy, education, economic empowerment, storytelling and strategic partnerships. Let Girls Lead’s vision is that girls have the power to transform their own lives, families, communities and the world. Let Girls Lead’s Global Girls’ Conversation will highlight girls’ power to create change. The Global Girls’ Conversation video contest is an exciting opportunity for girls, organizations working with girls and girls’ allies to submit one- to two-minute videos capturing girls’ solutions and successes. In partnership with the Huffington Post, Let Girls Lead will feature these compelling videos on the Global Girls’ Conversation interactive platform and on Huffington Post’s Global Motherhood column, sharing girls’ power to lead change with a global audience. Contest winners will receive $10,000 in cash, equipment, and training to create their own short films. For more information, please visit here.